When you have to read the same library book every night for two months (we had to renew it) you know that it is time that you went out and bought it. 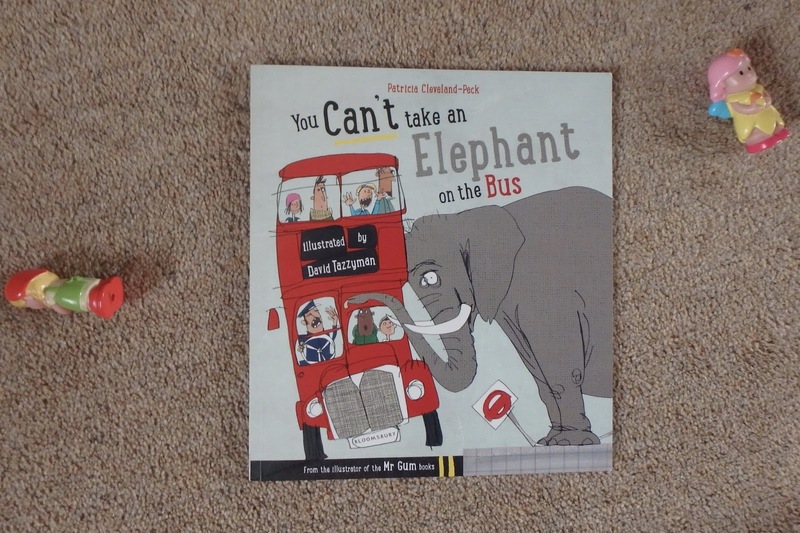 This has happened with two books lately - You can't take an elephant on a bus by Patricia Cleveland-Peck and illustrated by David Tazzyman was one of them. M loved the rhythm of this book with the poetry throughout and would sing along with it whilst I read. Each page brought giggles and such excitement. Now if you ask M whether an elephant can go on a bus she will laugh with glee... NOOOOOO mummy! What I love about this book is that it uses some complex language so is suited for little ones (we read it to our nine month old) and it would be suitable for older children too. These words might be beyond some little ones understanding but it is great to have these included as it introduces some more words to them. The illustrations, documenting the mayhem all the animals that you encounter throughout the book cause when using the different methods of transportation, are brilliant. A great, funny book which captivates the reader. Yeah I love them too. Hate when you get a boring book out of the library for them as they all too often find it boring too. We might have to see if we can borrow that one. We love this book!! It is so funny and we've read it many times too!